Anne Yafi’s multi-media work exists at the intersection of painting, drawing and sculpture, creating playful works that combine traditional mediums with functional objects addressing consumer and craft culture via an orientation towards pleasure. Yafi trained as a painter at Northern Illinois University, Dekalb (BFA, 2011) and began her site-responsive installation work while studying at The School of the Art Institute Chicago (MFA, 2015). Yafi’s solo shows include Dip In My Daydream, at 65GRAND (Chicago), Does It Feel Delicious, at Kruger Gallery (Chicago), and Fresh Work, at Free Range (Chicago). Artist-in-Residence at ACRE (Steuben, WI). Yafi maintains a studio at her home in Algonquin, IL and at Mana Contemporary Chicago. I view my pipe cleaner work(s) as three-dimensional paintings, an exercise in breaking free from the dimensional limitations of the pictorial frame by exploring the poetics of space. 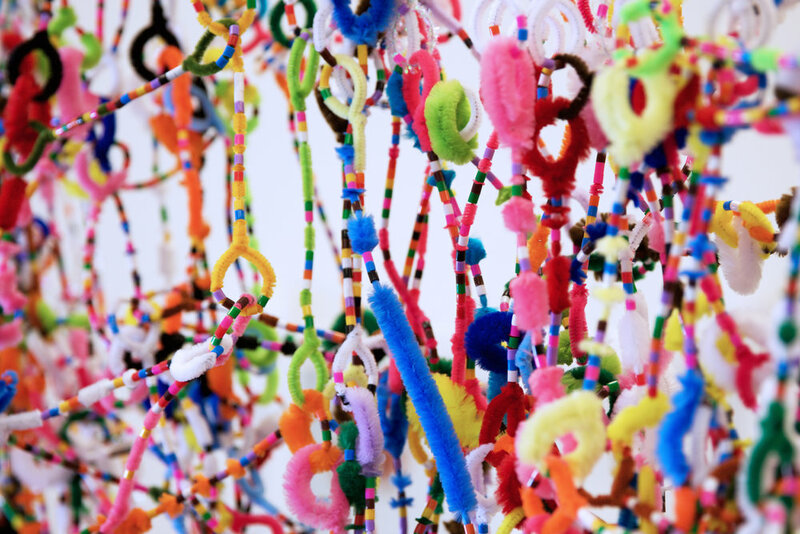 Pipe cleaners provide lineation, repetition and mediated elements of color that visually and tacitly engage the viewer through the representation of holding attention. They (pipe cleaners) are exceptionally lightweight and cozily inviting yet withstand gravity and provide a hidden strength and functionality that belies their appearance, thus I exploit the contradictory qualities of this material in reference to the body, feminism, and the ownership of space as the underlying narrative.